The Roland D-50 was and still is one of my favourite synths of all time. I noticed that there weren't any patch banks dedicated to ambient pad sounds so i decided to make my own, resulting in the Linear Universe sound bank containg airy, ambient, astrological, atmopsheric, ethereal, mystic, planetar spiritual sounds. The Linear Universe sound bank will breath new life into your Roland D-50. Linear Galaxy is the follow up of the previous soundbank Linear Universe. It's a sound bank for the Roland D-50 & D-550 containing 64 new and original patches (8 banks of 8 patches). 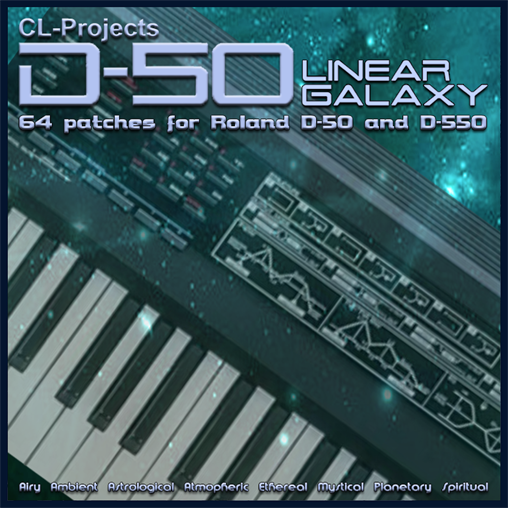 The Linear Galaxy sound bank focuses mainly on atmospheric and ambient pad sounds demonstrating the full potential of the Roland D-50.The sounds are very well suited to be used in ambient and new age music. Every musician who owns a D-50 synthesizer and plays or loves ambient, new age music, should have this sound bank. You won't regret it. All sounds except the drums are from the Linear Galaxy sound bank. VST effects were used.